There was a group of gentleman (I would guess in their 50’s) that occupied a suite on the first floor of our condominium. Each morning, they would emerge from their room between 9-10 AM and begin a solemn procession to the beach. The convoy was always led by someone carrying an LSU flag and they would place it beside the large tent they erected each day. Once base-camp was established, they would spend the remainder of the day drinking and enjoying a sacred kinship with mother-nature. There was one among their number (we will call him Bob) who would randomly break into applause throughout the day. Initially I believed this to be a non-verbal response to the appearance of a woman in a bathing suit, but as the day wore on the clapping appeared attributable to Bob’s Bud Light intake as opposed to any external stimuli. Once sunset was upon them, the lead man would again take up the LSU flag and the procession would reverse itself. Someone had systematically removed the letter “L” from all signage around the swimming area. 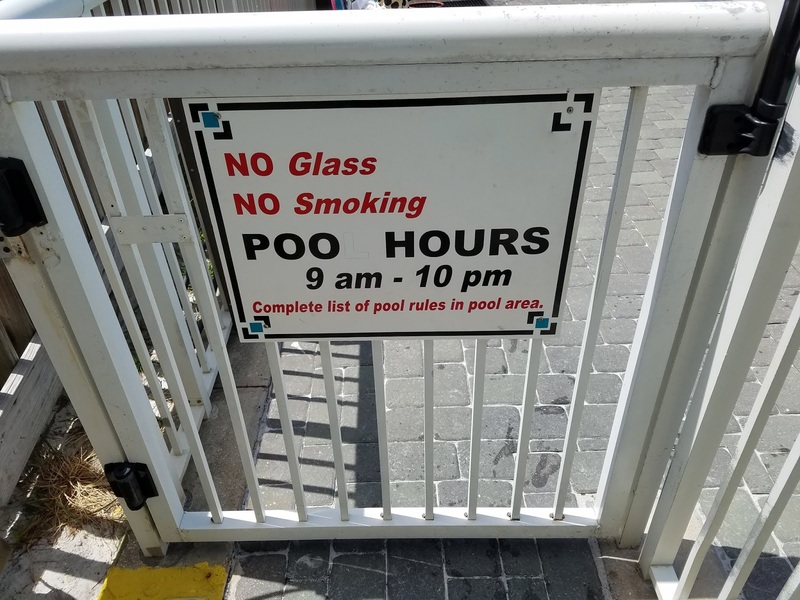 The result was that the entrance sign read “Poo Hours” (followed by the allocated defecation times) and the other two signs were labeled “Poo Rules” as if they were making a case for the superiority of feces. This drew an involuntary chortle from me each time we visited the pool and my wife speculated that such tomfoolery was the result of some teenagers. I choose to believe that the vandalism was perpetrated by a group of retirees. Pool vandalism aside, our condominium was a tightly-run ship. The elevator reminded all guests that “overly boisterous” behavior in and around the common areas would not be tolerated. I remarked to my wife that the overall boisterousity of behavior would be difficult to objectively quantify. Furthermore, the guidelines posted inside the unit – subsection 7 – prohibited the unreasonable volume of all “phonographs, radios, television sets, and musical instruments.” Either the rules pre-date the structure, or they are dealing with a wave of hipster retro audiophiles. I am grateful that my son is still unable to read. We visited several gas station restrooms on our journey, and the percentage of male genitalia with a cell phone number is staggering. Making the pool signage even more ironic, my daughter’s swim-diaper sprung a leak on our last day there. I was talking to another gentleman in the pool when she jumped in beside me. As she rose to the surface, I noticed what appeared to be an algae trail behind her. Once I realized the situation, I grabbed her out of the pool and wrapped her in a towel. Wishing to alert my wife and son without alarming the rest of the guests, I utilized all of the subtlety in my arsenal to explain that our daughter needed to go UPSTAIRS TO THE POTTY [wink, wink, nudge, nudge] before disappearing. I briefly toyed with alerting my new friend, but he taking a cringe-inducing open-mouthed lap around the pool and it was battle conditions. Fortunately, my flight took me past a couple who were inseparable from their portable Bluetooth speaker (and the house music loudly emanating from it) so my daughter’s “I go poo-poo pool” statements were inaudible to most everyone but me. When I got upstairs, I had to put her in the tub and hose her down while she emitted gurgled screams of, “No Daddy!!!! Please No More!!! !” as I loudly replied that if she kept struggling it would only be worse for her. In hindsight, I judge those in the adjacent condominiums for not calling the police. One of my son’s fondest memories from the trip would have to be the garbage chute. The concept of placing refuse into a metal drawer and having it disappear upon reopen was nothing short of magical. He asked where the garage went, if there were people inside of the chute catching the garbage, and most importantly, why we were still taking our garbage out to the road like Neanderthals when such a contraption existed. My wife and I pretty sure that he utilized extras napkins to bulk-up the trash bag so we would need to take more trips into the hall. Arranging one's life philosophy around the ocean is better in principle than practice. Those who actually enjoy living in close proximity to the ocean find it unnecessary to spend extra money to remind complete strangers that they enjoy living in close proximity to the ocean.